Desolation. That is the best word to describe the Eight Peaks. Desolation. In the rugged peaks of the Worlds Edge Mountains only death can be found, but somehow many races of the Old World struggle to retain power in this region. The secret is that inside of the mountains lies great wealth from a Dwarven civilization that has outlived itself. Skarsnik, an unusually smart and tactically sound goblin, has managed to gain control of the region, and was even the self-proclaimed ruler of the Dwarf Hold of Karak Eight Peaks for a time. Until Belegar Ironhammer returned to claim his birthright. Although Belegar currently holds the hold, it is a constant balance of power between him, Skarsniks horde, and the devious skaven known as Queek Headtaker. It was on the eve of yet another assault against the hold that the destiny of Skarsnik and his tribes would change forever. Sitting in his command cave, Skarsnik indulged in a mushroom brew that had been delivered by Skeezer’s Red Moon tribe. Of course, Skarsnik knew this to be a bribe, mostly to keep him from having to send any of his tribe to help support the constant assaults of the Eight Peaks. But the gold was coming in, as were a variety of other tokens from the tribe. As Skarsnik indulged in the brew, in the back of his mind he knew he would have to put the chieftan in his place soon, lest he assume that the wealth he had truly belonged to him and the Red Moons, but this would be a matter for another day. Eventually drifting off to sleep, Skarsnik awoke in a cold sweat to the presence of another, one whom he did not immediately recognize but at the same time seemed so familiar. Immediately slashing out with a hidden dagger, the blade went right through the figure as if it was not there at all. And with this, in the middle of the night Skarsnik gathered all of his forces and marched on the Stonefist Clan, to retrieve a chest that held so much value that the Gods Gork and Mork would send such a creature of immense power. Although the members of the Stonefist Clan put up a valiant effort to defend their keep, the overwhelming numbers of the force Skarsnik bore down upon them with was too much, and the hold quickly fell. This victory would be short lived, however, as Belegar Ironhammer had finally caught up to them and quickly engaged the army in a counter attack, scattering much of Skarniks Horde and sending him fleeing. But it was enough time for Skarsnik to discover that the chest had been carried south, and he knew just the tribe that he could go to in order to get appropriate reinforcements, the Red Moons. Last edited by mousekiller on Tue Apr 19, 2016 6:30 am, edited 7 times in total. Skarsnik, self-proclaimed and fully recognized Warlord of the Eight Peaks, Chieftain of the Crooked Moon Tribe, and Overlord of the Red Moon Tribe, the Yellow Tooth’s, the Crooked Tooth’s, and many other tribes in the valleys of the Eight Peaks and the surrounding areas. 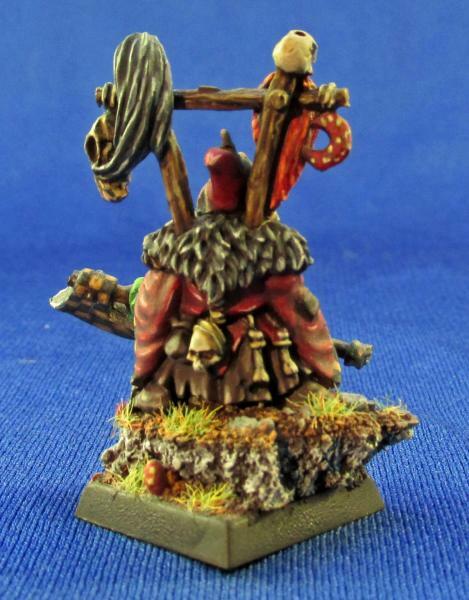 Also known as the King in the Mountain, the Cunning One, Dwarfs Bane and Skaven Slayer. To some in the early days he was known as RuntGit, a name no one dares to use anymore. 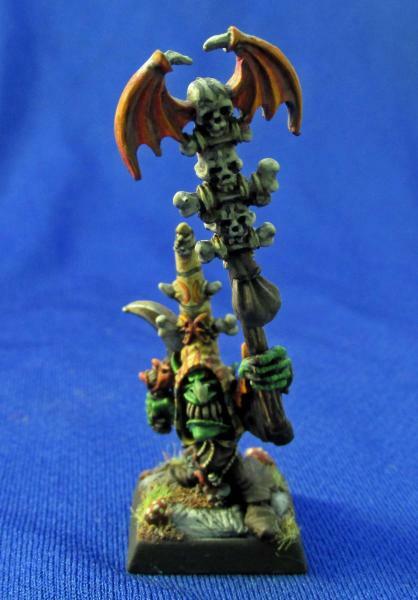 Unusually intelligent, sly, and an expert tactician for a goblin, Skarsnik has earned his place in Goblin society. 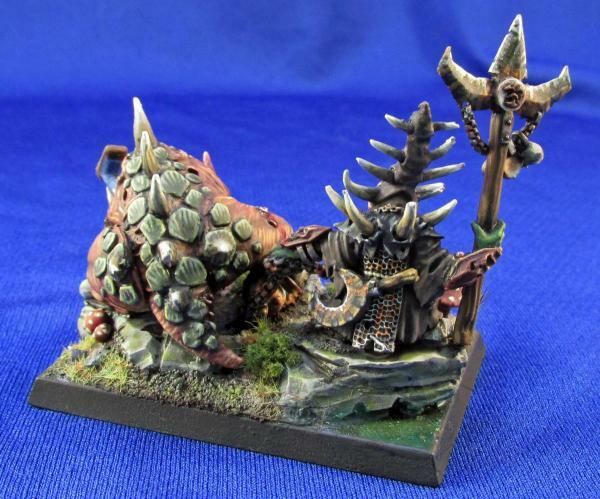 Skarsnik began life as a leader. Clawing his way from the birthing field with the rest of his litter, he led them throughout the caverns, foraging for food and other meager means of existence. One day the young goblins stumbled into the layer of the Goblin tribe called the Backstairs Boyz, subservient to the larger Crooked Moon Tribe, and were immediately enslaved and put to work doing the menial tasks of the tribe such as foraging for mushrooms in the dankness of the moldy sub caverns. Many years passed with Skarsnik performing this labor, with even his original litter growing much larger and moving on to other tasks. Known as the Runt, the one thing that was constant no matter how many new spawnlings were thrown into the cavers with him, one thing remained constant, Skarsnik was in charge. This did not go unnoticed within the tribe, and he was plucked from the meager task to be charged with a larger band of goblins and a much further range of foraging. Now bearing the now hated name RuntGit, Skarsnik began to impress even the Tribes leader, Tarkit Fing-Finger and Master Shaman Duffskull by finding and locating many rare items. But while he pleased his masters on one hand, on the other he plotted ways to gain more power. Secretly freeing the Skaven captive, Skreekrik Yellowtooth, he proceeded to also help the one time leader of Clan Mors re-establish his hold over his burrow. With this new secret alliance, Skarsnik was able to bring a massive amount of wealth to the Backstairs Boyz, and his favor with the tribal leadership continued to grow. But, Skarsnik grew complacent in his dealings, and he was found out by another sneaky git, Snotruk. Tarkit was enraged upon finding out that Skarsnik had dealt with their enemy, and immediately ordered his death. But not only was Skarsnik incredibly cunning, he was also extremely lucky. It was at this exact moment that a small band of Dwarves descended upon the tribe, and Skarsnik was able to escape into the river where he quickly floated away. Washing up on the outskirts of Karak Eight Peaks, Skarsnik was taken prisoner by a band of Goblin Wolf Riders, known as the Griffs Boyz and led by the Great Grillzer-Griff Makiki da Cunning. Something about the ragged goblin found on the rocks intrigued Griff, and so he caged Skarsnik in a small bird cage, which fit Skarsnik just enough that his arms and legs dangled from the bars. Griff would keep him caged for years, making him sing to him in the evenings. Skarsnik used this time to observe the trading patterns of the Wolf Riders, who showed quite a knack for dealing with a multitude of tribes across the Badlands. 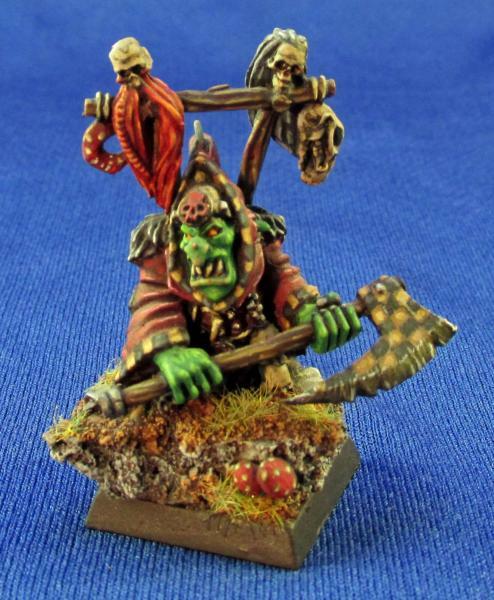 The tribe traded with Ogres, Orcs, and Goblins primarily, but also dabbled in trade with Skaven, humans, and the Dwarfs (outskirts anyway, no proper dwarf would have deal with Goblins). But always the tribe knew what the different outposts wanted or needed, and would provide these key items to them. The Griff carried the cage with him everywhere, and Skarsnik used the time to learn the languages of the other races. Finally, after a chance encounter with a Dwarf dealing, the Griff witnessed Skarsniks grasp of the Dawi language and realized that his RuntBird could be put to better use as a spy and negotiator. Over the next few years, Skarsnik rose in prestige with the Griff Boyz. But he never forgot those years in the cage, and through cunning dealings and alliances was soon in a position to make his move. Over the years he had plotted the “accidental” deaths of goblins who opposed him, until one night the drunken and overly trusting Griff passed out in a tent, with only himself and his one-time prisoner. Skarsnik quickly made his move, slicing the Griffs throat and the next day he claimed the right to lead the tribe. By this time, no one of any standing was left to oppose him and he was readily accepted as the new Chief. Longing for the caverns of his birth, he maneuvered the Wolf Riders back to the his lost home. With this taste of power, Skarsnik began to realize he was meant to rule. Using the Wolf Riders as his core, he began to conquer all of the tribes of the Eight Peaks, folding both Goblin and Orc tribes under his leadership until only the Crooked Moons remained. 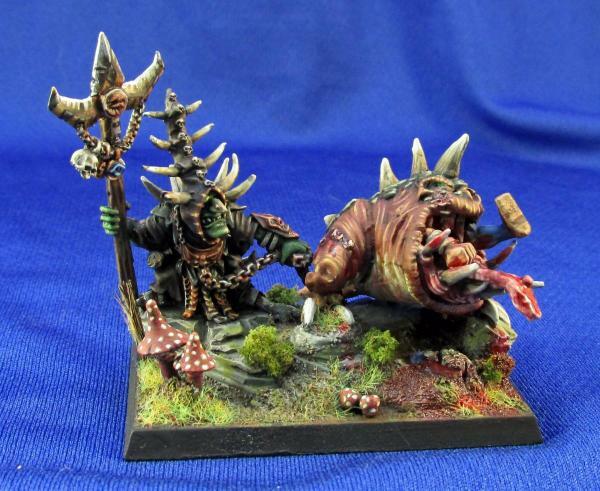 Leaving the army camped, Skarsnik wormed his way into the deeper caverns of the tribe, but was caught by his one-time rival and now Boss of the Backstairs Boyz, Snotrik who threw him into a pit of cave squigs to be eaten. Skarsniks luck would not fail him now, for in the pit was one of the largest cave squigs Skarsnik had ever seen. 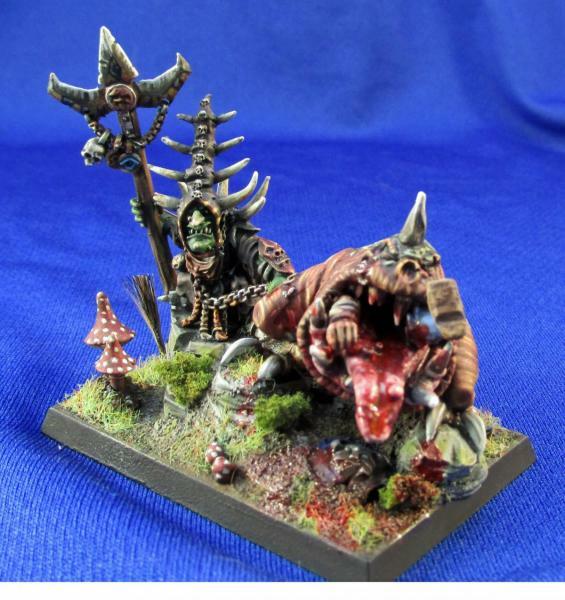 It also happened that Skarsnik, during his times running the runtlings through the tunnels, had saved this Squig from death when it was just a hatchling. Somehow the huge Squig remembered the smell of its savior, and immediately beat off the remaining squigs. At this same moment, the Wolf Boys came raging into the cavern, searching for their boss who had been gone too long. Feeding Snotrik to his newfound pet, Skarsnik immediately dubbed the creature Gobbla. This act, and the fact the Skaven clans had recently beaten most of the tribes in the area into submission, secured almost all of the greenskins under Skarsniks leadership. Over the next years, the Dwarfs returned to Karak Eight Peaks in force, under the leadership of Belegar Ironhammer and at great loss to their numbers regained the Hold. While the goblin tribes were distracted with this, the Skaven slowly infiltrated the deeper caverns once more, under the cunning leadership of Queek Headtaker. Soon, a virtual stalemate would arrive in the valley between the three races. Skeezer became the Chief of the Red Moon tribe through both cunning and luck. He was foraging in the lower peaks of the worlds edge mountains for mushrooms to help soothe his brothers (Snotgit) outbursts of magical energy, when he fell into a deep dark hole. In this hole he discovered a long abandoned dwarf hall, that showed signs of a great battle. In the center of the great hall lay the skeletal remains of a huge dragon, but more importantly, underneath these remains was a huge pile of collected treasure. Always one for moving up in the world, Skeezer knew that he had to somehow use this finding to his advantage, and so he payed a visit first to the current leader of the Red Moon Tribe, Bagnab. Bagnab saw great potential to take this treasure from Skeezer and just as he was about to order his death, Snotgit had one of his typical magical outbursts, causing enough commotion for Skeezer to escape. At this point, Skeezer felt that he had no other option but to gain the support of the most powerful Night Goblin of the Worlds Edge Mountains, Skarsnik. Paying Skarsnik a huge sum of gold, Skarsnik agreed to supply troops to Skeezer in return for the loyalty of the Red Moon Tribe to Skarsnik if Skeezer was able to take control of the tribe. Agreeing to these terms, Skeezer set off with a small contingent of night goblin levies to destroy Bagnab. Reaching the small village where Bagnab resided, Skeezer assaulted Bagnabs tent and easily overthrew the Chieftan. Though the remainder of the tribe was at first reluctant to accept Skeezer's leadership, he convinced them to move the village to his cave at spearpoint, and they soon accepted him as the new Chief. 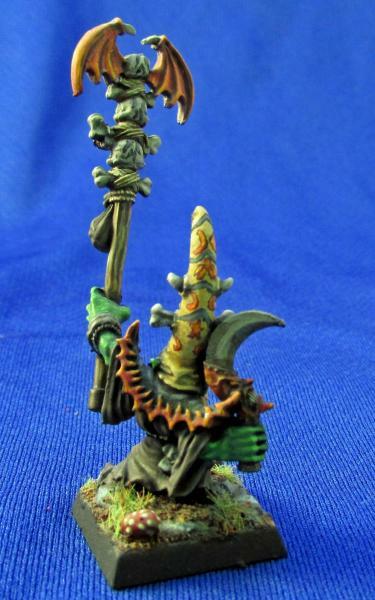 Returning to his secure hold, Skeezer has begun carving himself a small empire, absorbing some of the local goblin tribes into his own and ultimately, into the service of Skarsnik, to include the 'Ard Cap's and the Yellow Tooths. Since becoming the Chieftan of the Red Moon Tribe, he has taken the tribe on many raids into Imperial and Dwarven territories at the behest of Skarsnik himself. Of late, the tribe is having a lot of encounters with a particular band of Dwarfs who seem to be travelling directly through the Red Moon territory. Snotgit was abnormal from birth. Even as a young goblin, he would have strange outbursts of magical energy that would destroy things around him. If not for the careful guidance of his brother Skeezer, Snotgit would have surely perished in those early years. Only the magical mushrooms found in the Worlds Edge Mountains are able to control this. Once Skeezer learned of this, he carefully administered the brew to help his brother control these powers to his advantage. It was because of one of these magical outbursts that Skeezer was able to escape with his life and return to claim leadership of the Red Moon tribe. Now, Skeezer keeps Snotgit a steady supply of mushrooms in order to better control the outbursts. Snotgit is also gifted with the ability to make a magical mushroom potion that throws the simplest of goblins into an uncontrollable frenzy.